All these technology applications and yet people still play Solitaire and Scrabble? We all know now that the iPad has changed the world. A blurb in Ad Age today noted that Oprah (who is a big fan of the iPad and gave everyone on her magazine staff one this year) offered her ‘favorite’ iPad applications. For whatever reason, people seem obsessed with lists of things that Oprah says she likes (books etc.). 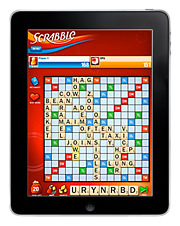 Scrabble was one of Oprah’s favorite iPad apps. When I rode the train in yesterday to New York I sat across from a gentlemen wearing headphones, using an iPad. What was he doing? Playing Scrabble. I thought it a bit odd at the time since with the cool 3G access he could have been doing so many things and yet he chose to play good ol’ Scrabble. Full disclosure – I LOVE SCRABBLE! But I’ve only played online once or twice and it did not do it for me. We still have an old fashioned Scrabble game with the wood tiles. Since I also travel by airplane a great deal I watch what people do while sitting in their seats. What I see often is work being done but I also see many people playing Solitaire on their computer. Your next question will no doubt have something to do with, ‘how old are these people’? Ok they are not 25 or 30 as far as I can tell. But many are not much older than that. It amazes me. And also makes me think – what does that mean? With all these increasingly cool technology tools where people can interact in real time on their iPad or web-enabled computer while flying, people seem to want to tune out and do things reminiscent of a simpler time. Are we perhaps suffering from device overkill? Can we possibly use all of these useful yet complex tools and applications that are being developed by the second from all corners of the world? How much is enough? How much is too much? I don’t have an iPad as yet. I do want one and have thought about how it could help make me more productive. I envision it being particularly useful when riding the train to and from New York from the suburbs such that I would not have to carry my heavy laptop all the time. And all the apps I could load – the Kindle app for reading, magazines to keep up with things that interest me could make it even more useful than a laptop itself. (Although typing on the iPad looks like a big pain in the neck – literally, so I’d need to have a plug in keyboard). But I wonder if I’d end up putting the Scrabble application on my iPad and while away the time trying to unplug from the world while at the same time being plugged in? How about you? Do you play Scrabble or Solitaire on your computer or laptop? If so why? This entry was posted in Customer Experiences, Living in the World Today, Marketing stuff and tagged Ipad applications, Oprah's favorite iPad apps, Scrabble, Scrabble on ipad, solitaire on computers. Bookmark the permalink. 2 Responses to All these technology applications and yet people still play Solitaire and Scrabble? I picked up an iPad over the summer but rarely play games on it. You’re right, it’s a great productivity tool when you’re on the train or out and about. It’s much easier to carry around town and is much faster to use than a laptop since it turns on instantly. We use Skype internally and the iPad’s client works great for both IM and voice. Battery life is great too – I’ve used it heavily over some long days but have yet to kill the battery. The iPad is also a great media consumption tool, the web, music and video work particularly well on it. My favorite “unproductive” application is the slingplayer, which streams live tv from my slingbox at home. Buy one and get the 3G version, you won’t regret it. If you want to kick the tires you’re welcome to try mine out. Hey thanks for the always insightful comment Jim. I feel I would use the iPad much as you would although with our office opening in NY the wireless email would be a big plus as I noted. Did not know about the battery life – another plus for sure. And the app you like is hardly as unproductive as…well you know. I may take you up on your offer. See you back in CT.